I’ve recently been working on a project that might be a good fit for the rising wave of Document Databases espoused by the rising NoSQL movement. Unlike the traditional Relational Databases like SQL Server, Document Databases can store object hierarchies, or unshaped data for quick and efficient saving and retrieval. There are quite a number of these databases appearing, including MongoDb, CouchDb, RavenDb. Wikipedia also has a listing of Document Databases with links to other options. Of course, this assumes you want to put the database in the c:\projects\data\mongo path. The path does need to be present before running this command. You will be prompted to open a firewall hole for Mongo. Once you’re done, Mongo should be up and running. Now that the database is running, we need to prepare the .Net provider. Download the NoRM provider through Github, or directly from their download site. Unzip these files and open the appropriate sln file in Visual Studio. 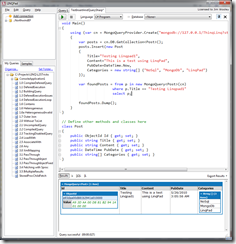 NoRM works in VS 2008 and NoRM – VS2010 works in VS 2010. Once you open it, compile it. Now you’re ready to roll. If you’re not sure how to get started with the NoRM provider, take a look at the many unit tests that they’ve provided to get up and running quickly. 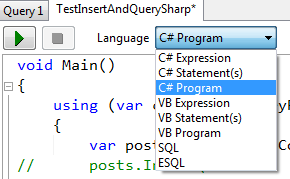 By selecting the Program option, we can now create not only LINQ queries, but entire classes and methods. Scroll to the bottom of the code window and add a class describing the shape that we want to save and retrieve. Keeping with the typical samples I have on this site, I’m modeling a Blog post. This will create a hierarchical shape containing posts with a collection of categories. Now that the shape is defined, we need to figure out how to insert and retrieve it using LINQPad. To start, press F4 (or select Query and Query Properties from the menu). This will bring up a dialog to add references. In this dialog, click the Add button and locate the Norm.dll that you generated when you compiled it above when Preparing NoRM. 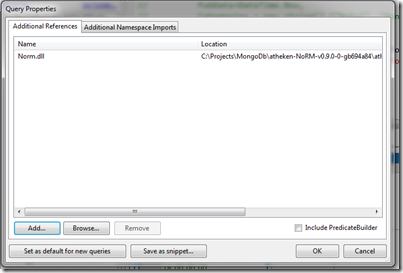 Before you close this window, select the “Additional Namespace Imports” tab at the top. This will allow us to add the Norm imports/using clauses. Add an import for Norm and Norm.Linq. 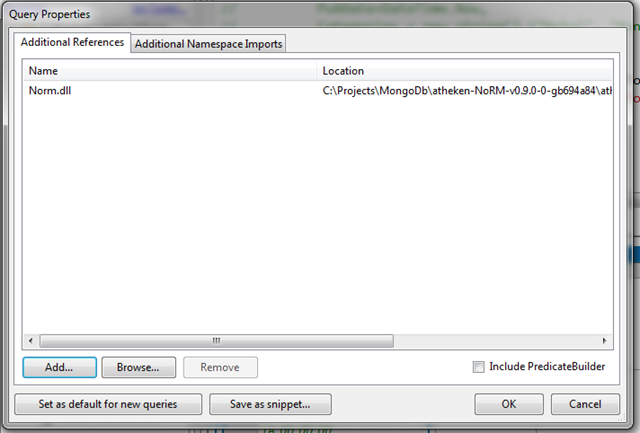 (Notice here, you don’t include the “using” or “imports” keywords, just the namespaces that you want to import.) Once you’ve added the reference, close the dialog so that we can continue consuming Mongo. 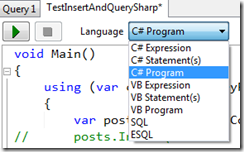 where p.Title == "Testing Linqpad"
Let’s step through this code a bit. The first line sets up our connection to the Mongo Database. We pass in the URI of the server (mongodb://127.0.0.1/) along with the name of the “database” that we want to use, or create if it hasn’t already been created (“ThinqLinq”). This connection behaves similarly to the LINQ to SQL DataContext or Entity Framework’s ObjectContext. As with those contexts, we next need to access the “Table” for the type that we are trying to create. We do that by accessing the GetCollection method of the DB object referencing the type that we want to get (Post). With the reference to the posts collection, we can insert a new Post object into our database by calling the Insert method. Notice, unlike a traditional RMDBS, we have not actually created anything in the database yet. This is the great thing about a Document Database. We can save our objects directly in the database without having to create the structures ahead of time. With the object inserted into the database, we can now fetch it back using a standard LINQ query. 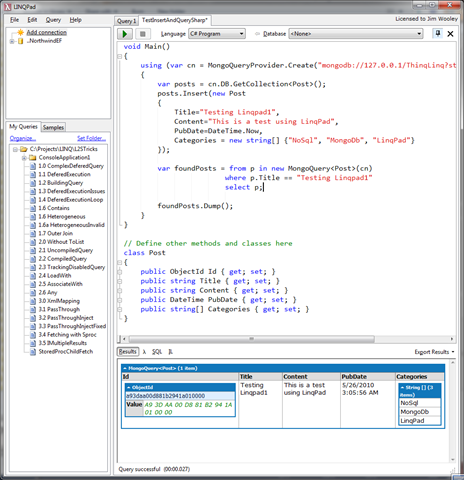 The only difference we see here to the pattern in other LINQ providers is that we access the data source by calling MongoQuery passing in the Type that we want to fetch and the connection object that we declared at the top of the method. We view the results by calling the LINQPad Dump extension method on the results. Once completed, here’s a screen shot including the final code and results. Notice that the results do include the three items we added in the Categories array along with the single post record. Interestingly, the built-in performance timer and Lambda expression options in LINQPad still work here even though we aren’t accessing a traditional database. The SQL tab remains blank because we aren’t issuing a SQL statement to Mongo. Document Databases and the whole NoSQL movement are quite intriguing. There are plenty of times where relational data stores are a better fit, particularly when you are needing to report on related objects rather than working with object hierarchies natively. However, tools like MongoDB and NoRM make working with non-traditional hierarchical document stores quite easy as well and point to some interesting options for data storage and retrieval for other needs.